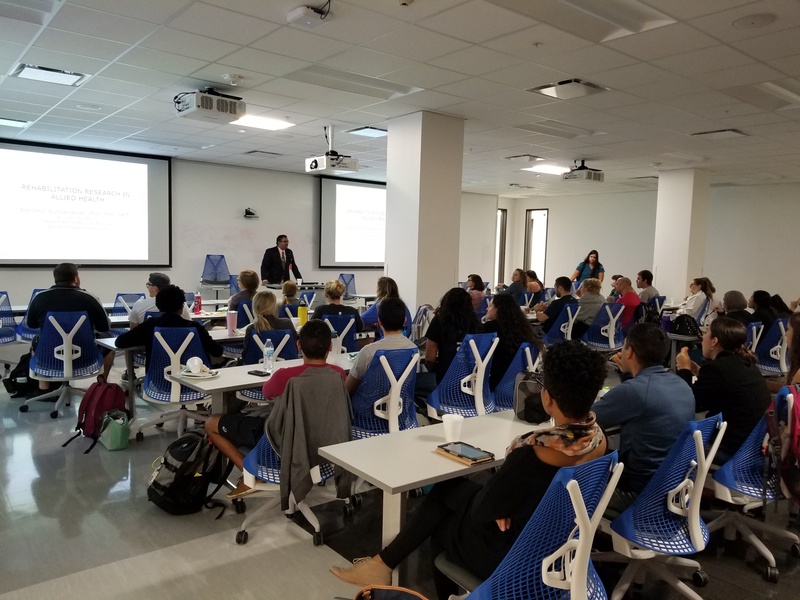 Sandeep Subramanian, Ph.D., MS, BPT, physical therapy assistant professor highlighted the impact of rehabilitation research in the health professions during a presentation during National Allied Health Week. Subramanian took a creative approach in his Nov. 8 Lunch & Learn presentation by describing the kinds of treatment a soldier injured in a blast would receive. Subramanian used the scenario to show how the soldier’s care would be informed by research from across departments within the School of Health Professions. Subramanian illustrated his point by referencing research by various School faculty, including emergency pre-hospital patient transport (Emergency Health Sciences), warming blankets (Physician Assistant Studies), ginkgo biloba’s effect on blood glucose (Medical Laboratory Sciences), breathing assistance guidelines (Respiratory Care), wheelchair seating and positioning (Occupational Therapy), as well as research from Speech-Language Pathology on communication disorders in veterans with traumatic brain injury (TBI) and Subramanian’s own Physical Therapy research on estimating the minimal number of repetitions for practice of tasks involving the upper limbs in this population. “We can push boundaries and we should push them,” Subramanian said of the role of research in the allied health professions. Selina Morgan, PT, DPT, physical therapy clinical assistant professor appreciated Subramanian’s presentation. “He was able to offer a perspective of how interdisciplinary research is useful to serve various patient populations,” she said. “Each discipline contributes to evidence-based clinical problem solving from our unique perspectives. I also appreciate the points that he made related to how important proper appraisal of the evidence is toward improving patient outcomes.